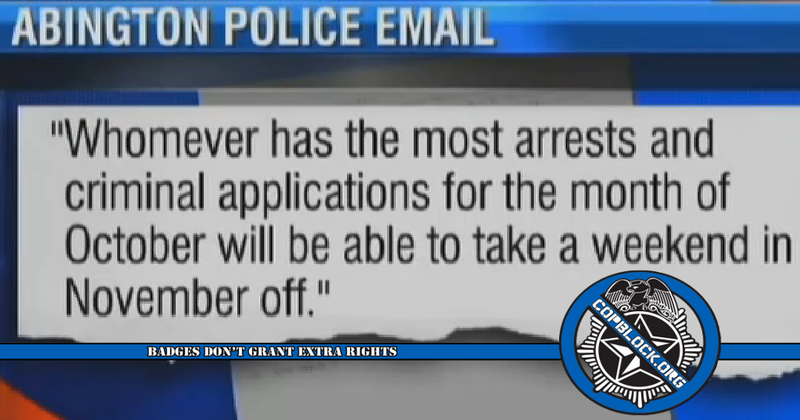 In the spirit of the holidays, Chief David Majenski of the Abington Police Department, in Massachusetts, sent out an email to “motivate” his officers proposing a “friendly competition” to see who could kidnap the most people within the month of October. The winner was to receive a weekend off in November as a bounty. Somehow encouraging cops within their city to find any excuse they could to pad their arrest numbers didn’t sit well with the citizens of Abington. Although the competition is supposed to be voluntary according to Chief Majenski, it raised obvious questions about the effect it might have on the perceived objectivity of police officers and the fact that it created a de facto quota system. “They are supposed to be neutral and independent when they are investigating potential criminal wrongdoing,” Krowski said. “It shows a motive, motive and bias against the defendant. A lack of neutrality,” [defense attorney Joseph] Krowski said. The rumors (that I just started) of another contest Chief Majenski was considering to see which officer could beat up the most minorities in the month of December have yet to be confirmed (it’s probably “voluntary,” also).